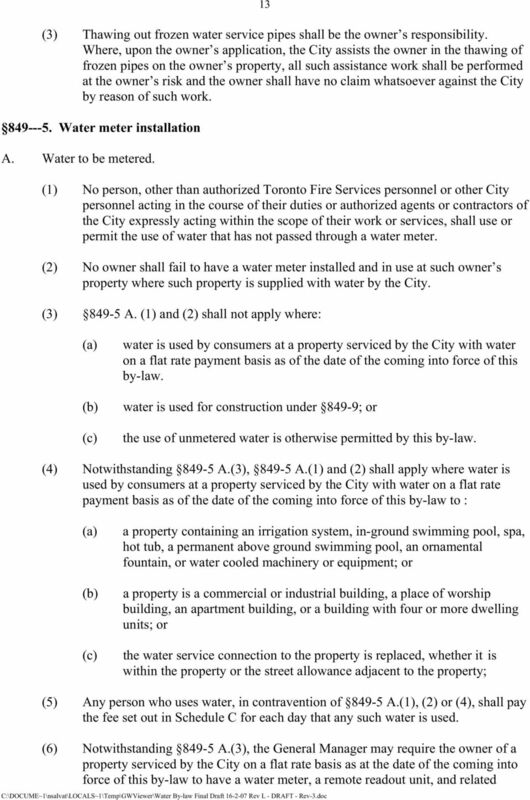 Download "Proposed New City of Toronto Water Supply By-law CONTENTS. 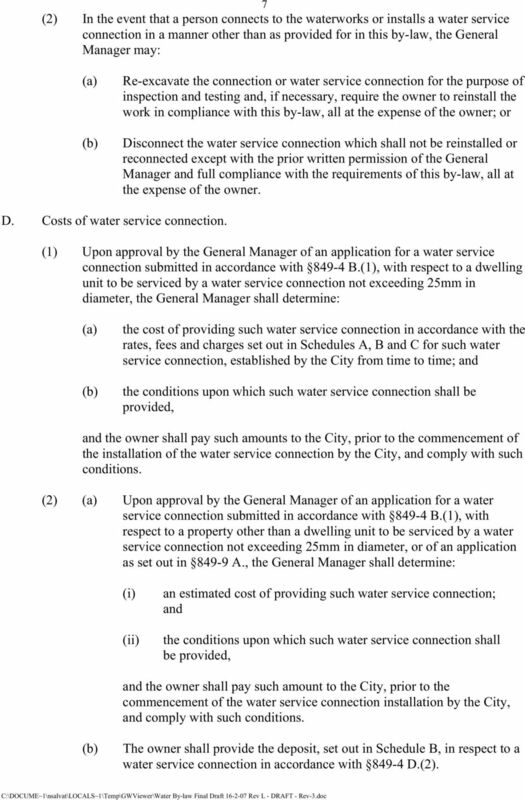 Water Supply By-law. 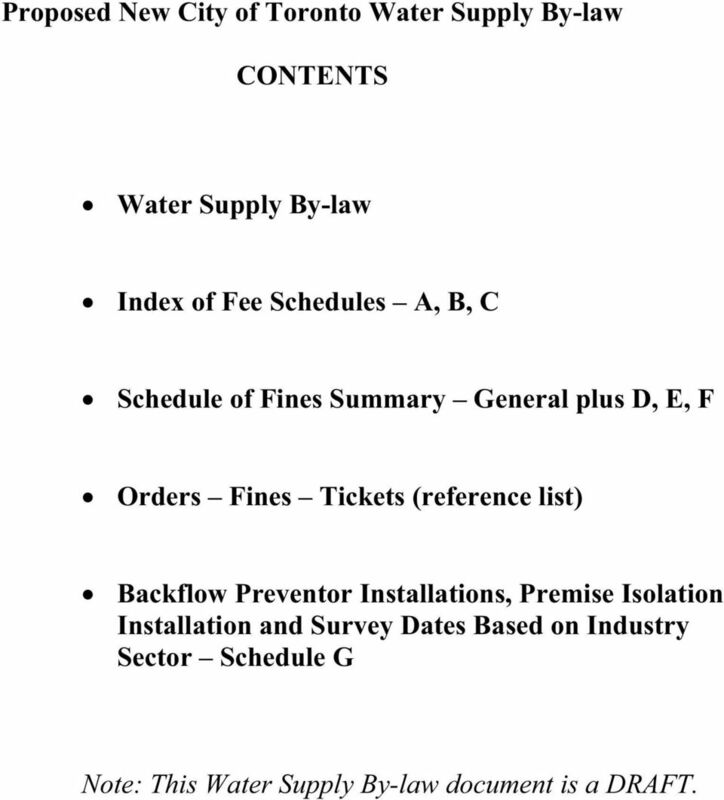 Index of Fee Schedules A, B, C. Orders Fines Tickets (reference list)"
1 Proposed New City of Toronto Water Supply By-law CONTENTS Water Supply By-law Index of Fee Schedules A, B, C Schedule of Fines Summary General plus D, E, F Orders Fines Tickets (reference list) Backflow Preventor Installations, Premise Isolation Installation and Survey Dates Based on Industry Sector Schedule G Note: This Water Supply By-law document is a DRAFT. 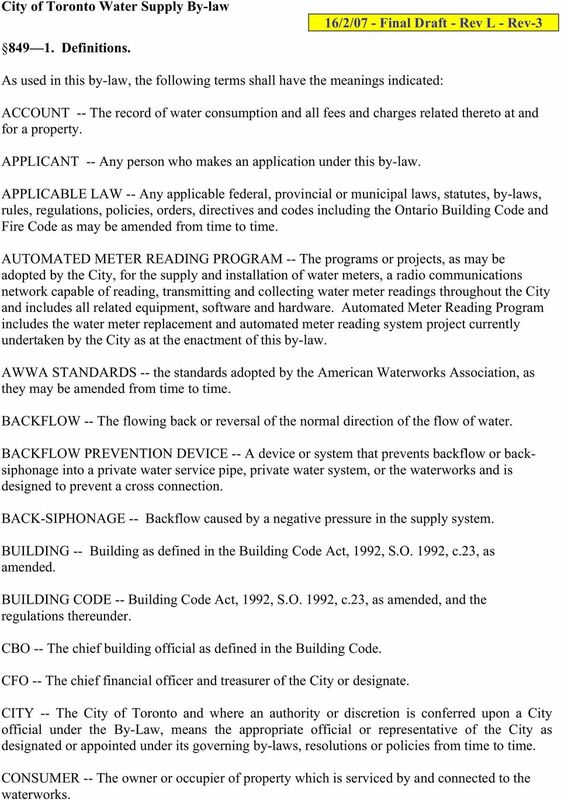 2 City of Toronto Water Supply By-law Definitions. 16/2/07 - Final Draft - Rev L - Rev-3 As used in this by-law, the following terms shall have the meanings indicated: ACCOUNT -- The record of water consumption and all fees and charges related thereto at and for a property. APPLICANT -- Any person who makes an application under this by-law. APPLICABLE LAW -- Any applicable federal, provincial or municipal laws, statutes, by-laws, rules, regulations, policies, orders, directives and codes including the Ontario Building Code and Fire Code as may be amended from time to time. AUTOMATED METER READING PROGRAM -- The programs or projects, as may be adopted by the City, for the supply and installation of water meters, a radio communications network capable of reading, transmitting and collecting water meter readings throughout the City and includes all related equipment, software and hardware. Automated Meter Reading Program includes the water meter replacement and automated meter reading system project currently undertaken by the City as at the enactment of this by-law. AWWA STANDARDS -- the standards adopted by the American Waterworks Association, as they may be amended from time to time. BACKFLOW -- The flowing back or reversal of the normal direction of the flow of water. BACKFLOW PREVENTION DEVICE -- A device or system that prevents backflow or backsiphonage into a private water service pipe, private water system, or the waterworks and is designed to prevent a cross connection. BACK-SIPHONAGE -- Backflow caused by a negative pressure in the supply system. BUILDING -- Building as defined in the Building Code Act, 1992, S.O. 1992, c.23, as amended. BUILDING CODE -- Building Code Act, 1992, S.O. 1992, c.23, as amended, and the regulations thereunder. CBO -- The chief building official as defined in the Building Code. CFO -- The chief financial officer and treasurer of the City or designate. CITY -- The City of Toronto and where an authority or discretion is conferred upon a City official under the By-Law, means the appropriate official or representative of the City as designated or appointed under its governing by-laws, resolutions or policies from time to time. CONSUMER -- The owner or occupier of property which is serviced by and connected to the waterworks. 4 3 shareholders of such corporation, and shall include any person with authority or power over or control of such property on the behalf of an owner. An owner includes a developer. PERSON - A natural person, an association, a partnership or a corporation, and the heirs, executors, administrators or other legal representatives of a person to whom the context can apply according to law. PREMISE ISOLATION The isolation of the water located within a building, structure or property from the waterworks. PRIVATE FIRE SERVICE MAIN -- The pipes, fittings and appurtenances from the water service connection conveying water for fire protection or suppression to all points in a fire protection or suppression system. PRIVATE METER -- A water meter which is not owned, serviced or maintained by the City. PRIVATE WATER SERVICE PIPE -- The pipe, fittings and appurtenances which convey water from the water service connection to a water meter, or to the point where the pipe and fittings connected to the water service connection enters a building or structure if there is no water meter. PRIVATE WATER SYSTEM -- An assembly of pipes, fittings, valves and appurtenances that convey water from the private water service pipe to water supply outlets, fixtures, plumbing appliances, devices, and appurtenances and all other points downstream of the water meter or downstream of the point where the private water service pipe enters a building or structure if there is no water meter. PROPERTY -- Includes a house, building, structure, lot or part of a lot, or any part of a house, building, structure, lot or part of a lot which has a unique municipal address, adjacent to the waterworks, save and except property owned and occupied by the City but not including a property owned and occupied by a corporation of which the City is a shareholder. REMOTE READOUT UNIT -- Any device which is used to record or transmit, or both, the water consumption reading of a water meter and may be installed at a separate location from the water meter but does not include the water meter register. RENOVATED BUILDING -- Any building or structure where the plumbing or piping around or adjacent to a water meter is changed or altered. ROAD ALLOWANCE -- A common and public highway including a portion of a highway as defined in the Municipal Act, ROOM -- An area, or part of an area, in which a person may normally stand upright, of four and sixty-four hundredths (4.64) square metres or more in a building, fully enclosed with a means of access and egress, which may include, without limitation, any bedroom, living room, dining room, kitchen, recreation room, summer kitchen, kitchenette, breakfast room, conservatory, sun room, enclosed veranda and enclosed back porch but does not include a bathroom. SHUT-OFF VALVE -- The valve on or at a water service connection owned and used by the City to shut off or turn on the water supply from the waterworks to a property. 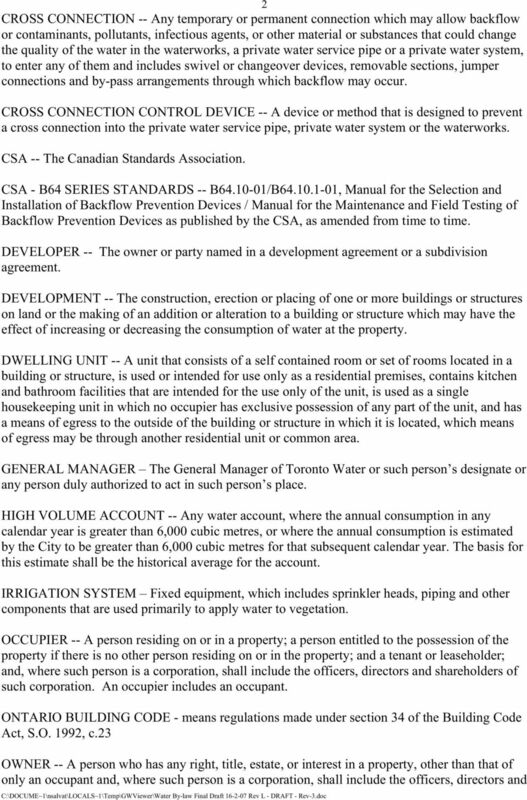 5 4 STANDARDS AND SPECIFICATIONS -- The City of Toronto s Standard Construction Specifications and Drawings for Sewers and Watermains as prescribed by the General Manager, from time to time. STREETLINE -- The boundary of a property which adjoins a road allowance. SUBSTANTIALLY DEMOLISHED -- The demolition of more than 50% of the exterior walls of the first story above grade of a building or structure, whether or not they are subsequently replaced. TEMPORARY WATER METER - a water meter which measures the quantity of water consumed at, in or upon a property during the construction of a structure, or during such other temporary purpose as may be approved by the General Manager, intended to be temporary and removed upon completion of the structure or other temporary purpose and is read, serviced, maintained or supplied by the City. TEMPORARY WATER SERVICE CONNECTION - a water service connection to the waterworks for the purpose of the construction of a structure, or such other temporary purpose as may be approved by the General Manager, intended to be temporary and removed upon completion of the structure or other temporary purpose and may also include a temporary connection to a fire hydrant. UNIVERSAL METERING PROGRAM -- Any program or project adopted by the City from time to time to supply and install new water meters, remote water meter reading devices and meter seals on all unmetered properties within the City. WATER -- Potable water supplied by the City. WATER METER -- An apparatus at a property which measures and records the quantity of water passing through it and is read, serviced, maintained or supplied by the City. WATER SERVICE CONNECTION -- That part of the waterworks, consisting of pipes, fittings and appurtenances which supplies water to a property, and which is located between the City watermain and the streetline or between the City watermain and the boundary line between a City easement or other City land containing the watermain and private land. WATERWORKS -- Any works for the collection, production, treatment, storage, supply, transmission and distribution of water by the City, or any part of any such works including the water service connection, but does not include plumbing to which the Building Code Act, 1997, or any amendments thereto apply. Any reference to the General Manager or any other officer of the City shall be construed to mean the person holding that office from time to time, and the designate or deputy of that person, and shall be deemed to include a reference to any person holding a successor office or the designate or deputy of that person. A reference to any Act, statute, by-law, order, rule or regulation or other similar instrument or to a provision thereof shall be deemed and construed to include a reference to any Act, statute, bylaw, order, rule or regulation or other similar instrument or provision enacted in substitution thereof or amendment thereof. 6 Administration. 5 A. The administration of the waterworks and fixed water meter reading equipment shall be under the jurisdiction of the General Manager. B. The administration of water meter reading, water rates, accounting, billing and collection shall be under the jurisdiction of the CFO. C. The administration of the installation of new, renovated or altered private water service pipes, private fire service mains, private water systems and appurtenances, cross connection control devices and backflow prevention devices on private property shall be the responsibility of the CBO and the General Manager. D. The administration of inspections of existing private water service pipes, private fire service mains, private water systems and appurtenances, cross connection control devices and backflow prevention devices on private property shall be the responsibility of the General Manager. E. The General Manager shall be authorized to prescribe any City form under this by-law and to amend or revise such forms from time to time. F. The General Manager shall be authorized to amend or revise City standards and specifications relating to this by-law as may be required from time to time. 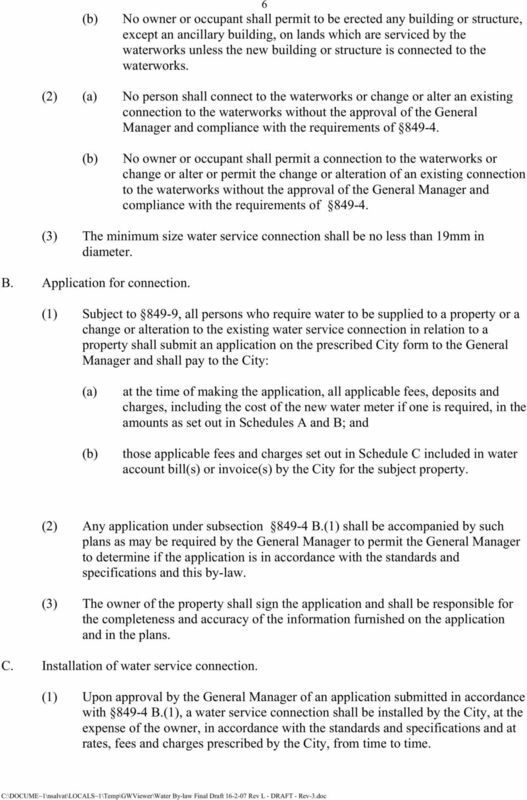 G. The City may authorize programs or projects which may exempt persons or properties from a provision or provisions of this by-law Use and receipt of water. A. 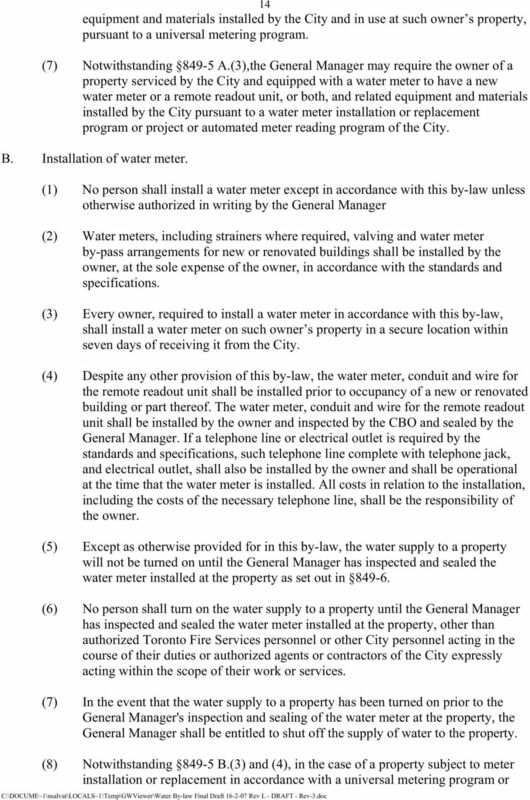 No person shall use, cause or permit water to be used otherwise than in connection with the property at which it is supplied nor shall water be sold or otherwise similarly disposed of without the prior written permission of the General Manager, other than authorized Toronto Fire Services personnel or other City personnel, acting in the course of their duties. B. 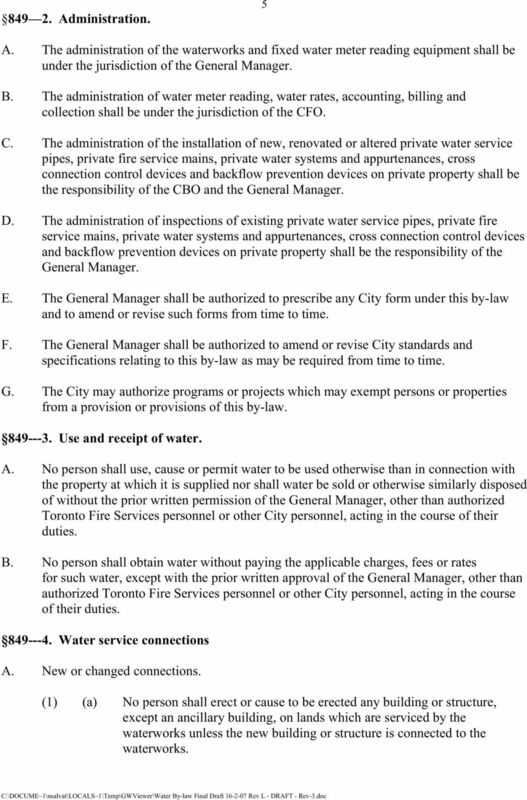 No person shall obtain water without paying the applicable charges, fees or rates for such water, except with the prior written approval of the General Manager, other than authorized Toronto Fire Services personnel or other City personnel, acting in the course of their duties Water service connections A. New or changed connections. (1) (a) No person shall erect or cause to be erected any building or structure, except an ancillary building, on lands which are serviced by the waterworks unless the new building or structure is connected to the waterworks. 7 (b) 6 No owner or occupant shall permit to be erected any building or structure, except an ancillary building, on lands which are serviced by the waterworks unless the new building or structure is connected to the waterworks. (2) (a) No person shall connect to the waterworks or change or alter an existing connection to the waterworks without the approval of the General Manager and compliance with the requirements of (b) No owner or occupant shall permit a connection to the waterworks or change or alter or permit the change or alteration of an existing connection to the waterworks without the approval of the General Manager and compliance with the requirements of (3) The minimum size water service connection shall be no less than 19mm in diameter. B. Application for connection. 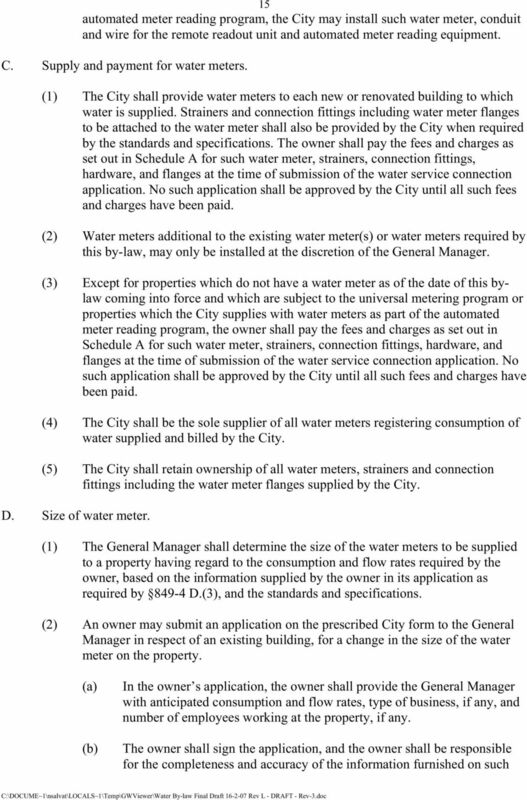 (1) Subject to 849-9, all persons who require water to be supplied to a property or a change or alteration to the existing water service connection in relation to a property shall submit an application on the prescribed City form to the General Manager and shall pay to the City: (a) (b) at the time of making the application, all applicable fees, deposits and charges, including the cost of the new water meter if one is required, in the amounts as set out in Schedules A and B; and those applicable fees and charges set out in Schedule C included in water account bill(s) or invoice(s) by the City for the subject property. (2) Any application under subsection B. (1) shall be accompanied by such plans as may be required by the General Manager to permit the General Manager to determine if the application is in accordance with the standards and specifications and this by-law. (3) The owner of the property shall sign the application and shall be responsible for the completeness and accuracy of the information furnished on the application and in the plans. C. Installation of water service connection. (1) Upon approval by the General Manager of an application submitted in accordance with B. (1), a water service connection shall be installed by the City, at the expense of the owner, in accordance with the standards and specifications and at rates, fees and charges prescribed by the City, from time to time. 8 7 (2) In the event that a person connects to the waterworks or installs a water service connection in a manner other than as provided for in this by-law, the General Manager may: (a) (b) Re-excavate the connection or water service connection for the purpose of inspection and testing and, if necessary, require the owner to reinstall the work in compliance with this by-law, all at the expense of the owner; or Disconnect the water service connection which shall not be reinstalled or reconnected except with the prior written permission of the General Manager and full compliance with the requirements of this by-law, all at the expense of the owner. D. Costs of water service connection. (1) Upon approval by the General Manager of an application for a water service connection submitted in accordance with B. 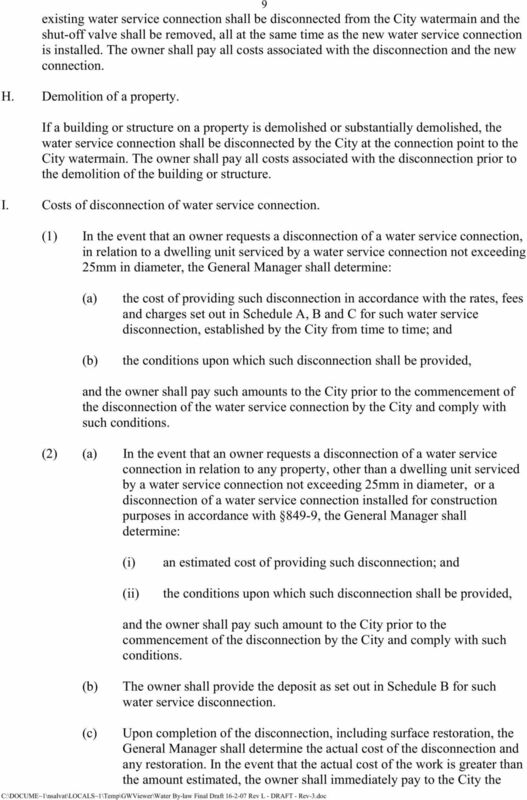 (1), with respect to a dwelling unit to be serviced by a water service connection not exceeding 25mm in diameter, the General Manager shall determine: (a) (b) the cost of providing such water service connection in accordance with the rates, fees and charges set out in Schedules A, B and C for such water service connection, established by the City from time to time; and the conditions upon which such water service connection shall be provided, and the owner shall pay such amounts to the City, prior to the commencement of the installation of the water service connection by the City, and comply with such conditions. (2) (a) Upon approval by the General Manager of an application for a water service connection submitted in accordance with B. (1), with respect to a property other than a dwelling unit to be serviced by a water service connection not exceeding 25mm in diameter, or of an application as set out in A., the General Manager shall determine: (i) (ii) an estimated cost of providing such water service connection; and the conditions upon which such water service connection shall be provided, and the owner shall pay such amount to the City, prior to the commencement of the water service connection installation by the City, and comply with such conditions. 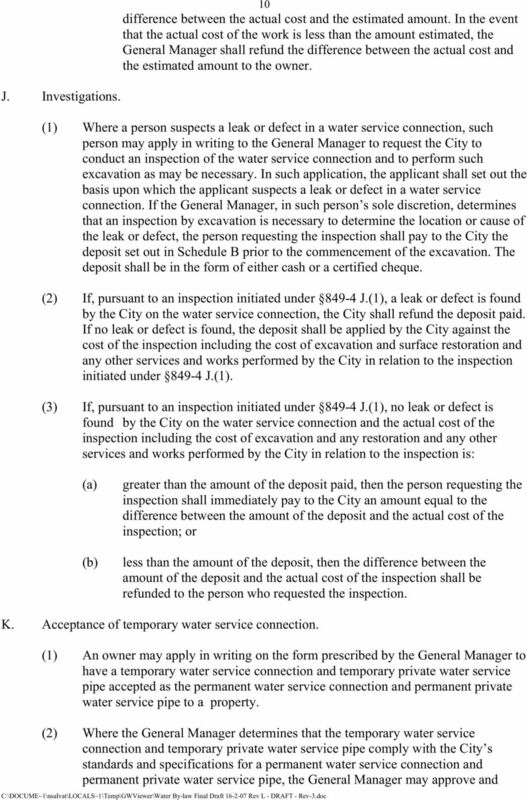 (b) The owner shall provide the deposit, set out in Schedule B, in respect to a water service connection in accordance with D.(2). 12 11 accept such temporary water service connection and temporary private water service pipe and shall advise the owner accordingly of the General Manager s decision. L. Installation and inspection of private water service pipe and private fire service mains. 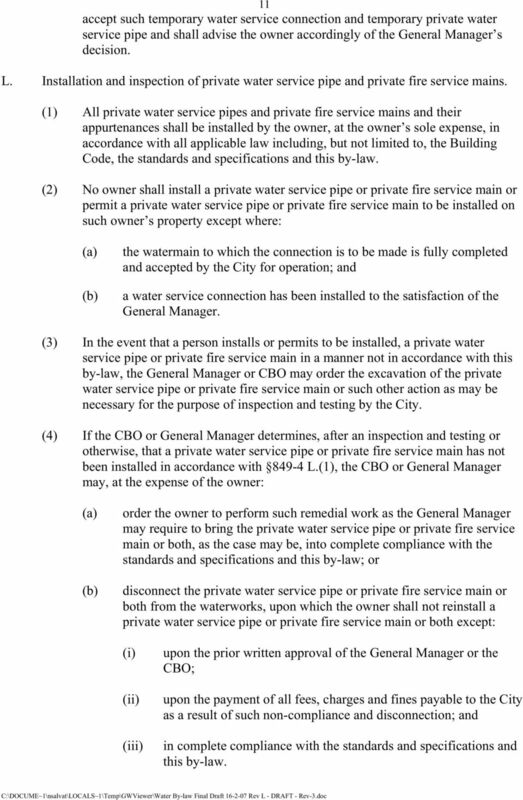 (1) All private water service pipes and private fire service mains and their appurtenances shall be installed by the owner, at the owner s sole expense, in accordance with all applicable law including, but not limited to, the Building Code, the standards and specifications and this by-law. 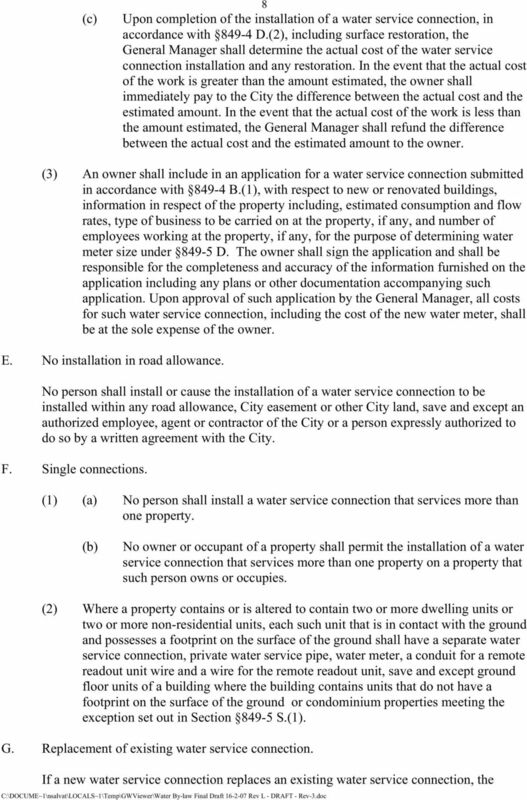 (2) No owner shall install a private water service pipe or private fire service main or permit a private water service pipe or private fire service main to be installed on such owner s property except where: (a) (b) the watermain to which the connection is to be made is fully completed and accepted by the City for operation; and a water service connection has been installed to the satisfaction of the General Manager. (3) In the event that a person installs or permits to be installed, a private water service pipe or private fire service main in a manner not in accordance with this by-law, the General Manager or CBO may order the excavation of the private water service pipe or private fire service main or such other action as may be necessary for the purpose of inspection and testing by the City. 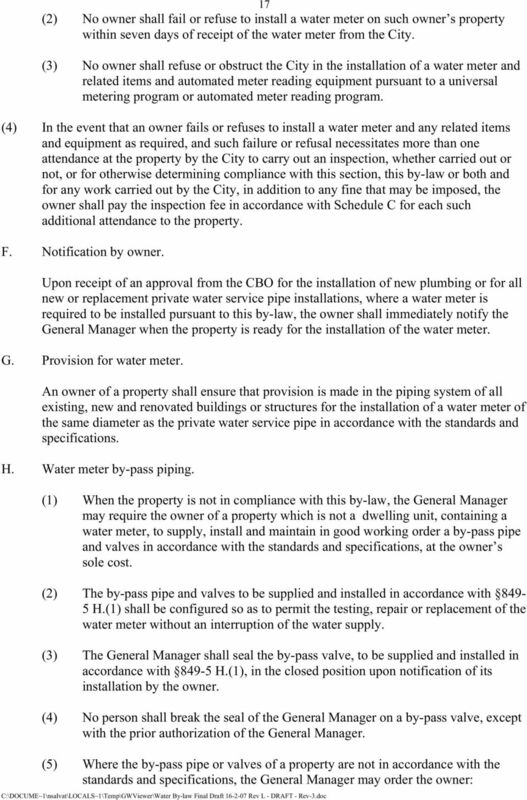 (4) If the CBO or General Manager determines, after an inspection and testing or otherwise, that a private water service pipe or private fire service main has not been installed in accordance with L.(1), the CBO or General Manager may, at the expense of the owner: (a) (b) order the owner to perform such remedial work as the General Manager may require to bring the private water service pipe or private fire service main or both, as the case may be, into complete compliance with the standards and specifications and this by-law; or disconnect the private water service pipe or private fire service main or both from the waterworks, upon which the owner shall not reinstall a private water service pipe or private fire service main or both except: (i) (ii) (iii) upon the prior written approval of the General Manager or the CBO; upon the payment of all fees, charges and fines payable to the City as a result of such non-compliance and disconnection; and in complete compliance with the standards and specifications and this by-law. 13 12 M. Maintenance and use of private water service pipe and private fire service main. (1) No owner of a property shall fail to keep all private water service pipes and private fire service mains on such property including but not limited to fittings, valves, meter chambers and supports thereof in good working order and repair at all times. (2) No owner of a property shall fail to repair any and all leaks, defects or malfunctions in, of or on the private water service pipe or private fire service main on such owner s property, including leaks, defects or malfunctions related to valves, fittings or corroded piping, as soon as possible after becoming aware of any such leak or defect or malfunction and no later than forty-eight (48) hours of the receipt of an order from the General Manager to make such repair. 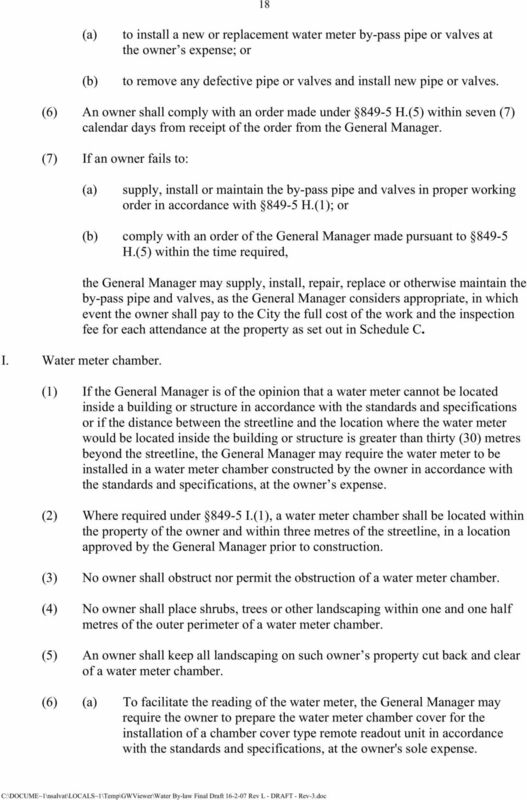 (3) The General Manager may require the owner to pay the fee as set out in Schedule C with respect to: (a) (b) each inspection and re-inspection that may be required by the General Manager in relation to any repair or failure to make a repair, or any water not registered by a meter or for any water loss or water discharge, or both, as a result of a leak, defect or malfunction in, of or on the private water service pipe or private fire service main or both on such owner s property. (4) The owner shall pay the fees payable under M.(3)(b) with respect to unregistered water as set out in Schedule C for each day the owner fails to make the required repairs. (5) Notwithstanding M.(4), where the owner can provide, to the satisfaction of the General Manager, an accurate record of the actual water lost as a result of the leak, defect or malfunction, the amount payable shall be equal to the amount so recorded to the satisfaction of the General Manager. N. Frozen water service pipe. (1) No owner of a property shall fail to ensure that all private water service pipes, the private water system and private fire service mains on such property are protected from freezing. 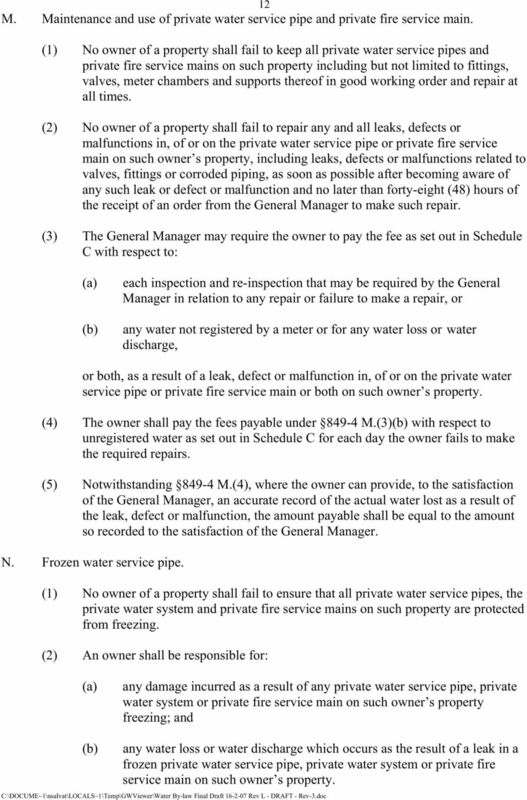 (2) An owner shall be responsible for: (a) any damage incurred as a result of any private water service pipe, private water system or private fire service main on such owner s property freezing; and (b) any water loss or water discharge which occurs as the result of a leak in a frozen private water service pipe, private water system or private fire service main on such owner s property. 17 16 application including any plans or other documentation accompanying such application. (c) All costs related to the application and, where approved, related to a change in size of water meter, including the cost of the new water meter, shall be at the sole expense of the owner, regardless of whether or not such change is approved by the General Manager (3) To confirm the accuracy of the information provided by the owner on an application made in accordance with D.(2), including any plans or other documentation accompanying such application, the General Manager may conduct flow monitoring tests on the private water service pipe or private water system of the subject property to determine the appropriate size and type of water meter to be installed on the property. (4) The owner shall, at reasonable times, provide the General Manager with clear and unobstructed access to the private water service pipe and private water system for the purpose of conducting any flow monitoring tests under D.(3). (5) In the event that the result of the flow monitoring tests under D.(3), indicate that the capacity of the new water meter is not appropriately sized for the property, the owner shall, at the owner's sole expense, change the water meter and adjacent piping to comply with the standards and specifications, if directed by the General Manager. 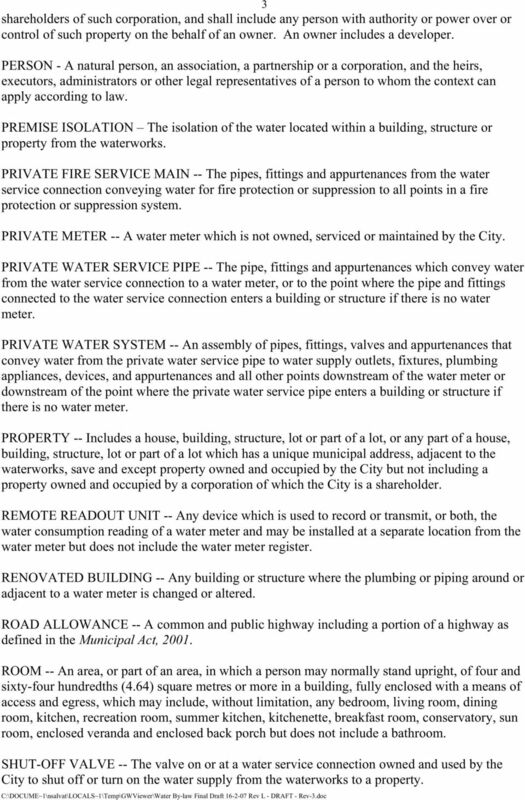 (6) For new or renovated buildings, and despite any other provision of this by-law, the charge payable by an owner for a water meter shall be based on a water meter of the same size as the new private water service pipe. (7) For existing water meter installations, the General Manager may install a water meter of a size more appropriate, in the General Manager s determination, for the owner s flow requirements and make any necessary adjustments to the piping around an existing water meter if flow monitoring tests indicate that the capacity of the existing water meter is not properly sized for the property. 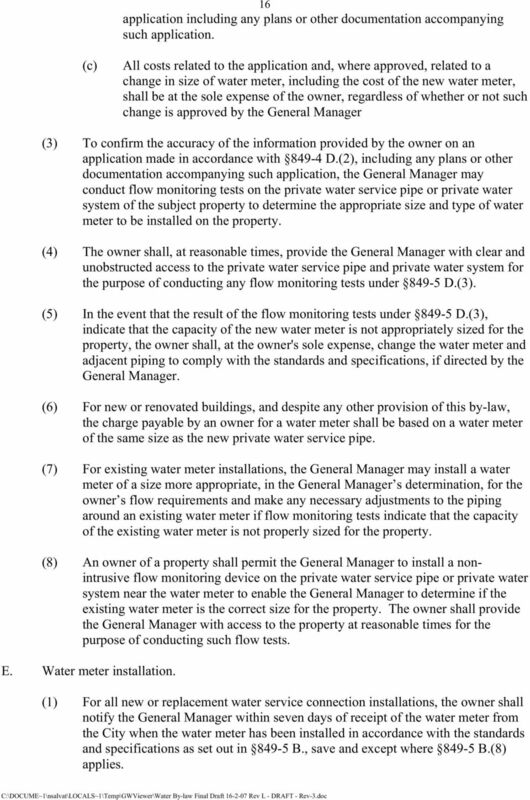 (8) An owner of a property shall permit the General Manager to install a nonintrusive flow monitoring device on the private water service pipe or private water system near the water meter to enable the General Manager to determine if the existing water meter is the correct size for the property. The owner shall provide the General Manager with access to the property at reasonable times for the purpose of conducting such flow tests. E. Water meter installation. 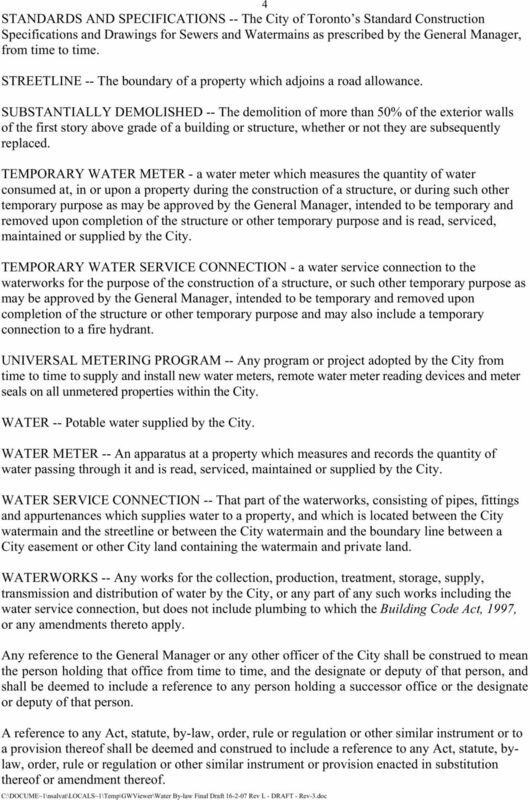 (1) For all new or replacement water service connection installations, the owner shall notify the General Manager within seven days of receipt of the water meter from the City when the water meter has been installed in accordance with the standards and specifications as set out in B., save and except where B. (8) applies. 19 18 (a) (b) to install a new or replacement water meter by-pass pipe or valves at the owner s expense; or to remove any defective pipe or valves and install new pipe or valves. (6) An owner shall comply with an order made under H.(5) within seven (7) calendar days from receipt of the order from the General Manager. (7) If an owner fails to: (a) supply, install or maintain the by-pass pipe and valves in proper working order in accordance with H.(1); or (b) comply with an order of the General Manager made pursuant to H.(5) within the time required, the General Manager may supply, install, repair, replace or otherwise maintain the by-pass pipe and valves, as the General Manager considers appropriate, in which event the owner shall pay to the City the full cost of the work and the inspection fee for each attendance at the property as set out in Schedule C. I. Water meter chamber. (1) If the General Manager is of the opinion that a water meter cannot be located inside a building or structure in accordance with the standards and specifications or if the distance between the streetline and the location where the water meter would be located inside the building or structure is greater than thirty (30) metres beyond the streetline, the General Manager may require the water meter to be installed in a water meter chamber constructed by the owner in accordance with the standards and specifications, at the owner s expense. (2) Where required under I. (1), a water meter chamber shall be located within the property of the owner and within three metres of the streetline, in a location approved by the General Manager prior to construction. (3) No owner shall obstruct nor permit the obstruction of a water meter chamber. (4) No owner shall place shrubs, trees or other landscaping within one and one half metres of the outer perimeter of a water meter chamber. (5) An owner shall keep all landscaping on such owner s property cut back and clear of a water meter chamber. 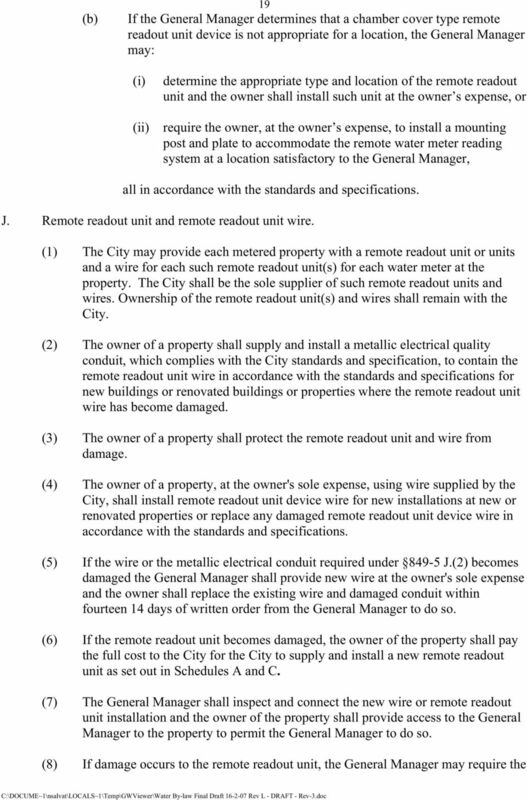 (6) (a) To facilitate the reading of the water meter, the General Manager may require the owner to prepare the water meter chamber cover for the installation of a chamber cover type remote readout unit in accordance with the standards and specifications, at the owner's sole expense. Texas Commission on Environmental Quality Page 1 SUBCHAPTER H: UTILITY SUBMETERING AND ALLOCATION 291.121-291.127 Effective January 6, 2011 291.121. General Rules and Definitions. (a) Purpose and scope. Chapter 880 FIRE ROUTES 880-1. Definitions. 880-2. Application for designation of private road as fire route. 880-3. Consideration of application. 880-4. Disposition of application. 880-5. Appeals. 880-6. CITY OF NIAGARA FALLS. By-law No A by-law regulating outdoor swimming pools in the City of Niagara Falls. Number 2 of 2011 MULTI-UNIT DEVELOPMENTS ACT 2011 ARRANGEMENT OF SECTIONS. 3. Conditions relating to sale of units in multi-unit developments. (House and Land) Approved by the Nova Scotia Real Estate Commission for use by Industry Members under the Real Estate Trading Act.